Hope you’re having a great weekend! Get out and enjoy this weather. Rain chances go up as time goes along this weekend. Expect the clouds to stay around today, but temps will be nice! Not expecting a washout, but some light/brief showers could swing by. Rain chances increase a bit overnight as instability increases. Won’t be surprised to hear a few rumbles of thunder. Not expecting any severe storms. A disturbance hangs around Sunday bringing showers and thunderstorms. 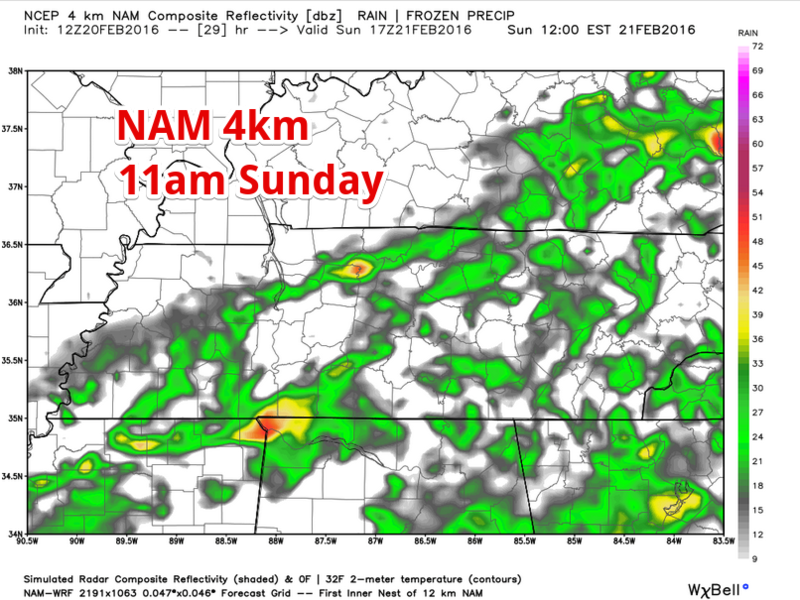 Nam4 Model thinks the best rain chances will be in the morning. Pic below of 11am Sunday with rain moving east. Looking Ahead: Rain moves out for Monday, temps drop back into the 50s, and we begin looking ahead to a strong low pressure system for mid-week. Models working out the details on the exact track of the low. Most bring it pretty close to Nashville. We’ll iron out those details after the models cook a little longer. This website supplements @NashSevereWx on Twitter, which you can find here.